German tosafist of the twelfth century; born probably at Bonn; died at Cologne about 1200. Joel studied in his youth at Ratisbon under Ephraim b. Isaac, Isaac b. Mordecai, and Moses b. Joel, with whom he later kept up a learned correspondence. It is not known whether he also studied under Isaac b. Asher ha-Levi of Speyer; but as Isaac b. Mordecai and Moses b. Joel were pupils of this great tosafist, they would naturally have communicated to their own pupils the doctrines of their master. Joel studied also at Würzburg and Mayence, where he was the pupil of Eliezer b. Nathan, who speaks of him with much affection, and whose son-in law he became. Joel taught chiefly at Bonn and Cologne, and at his death was succeeded by his son Eliezer b. Joel as rabbi and teacher in the latter city. Another son, Uri, died as a martyr at the stake in 1216; and his friend Mordecai b. Eliezer wrote a dirge on his death. 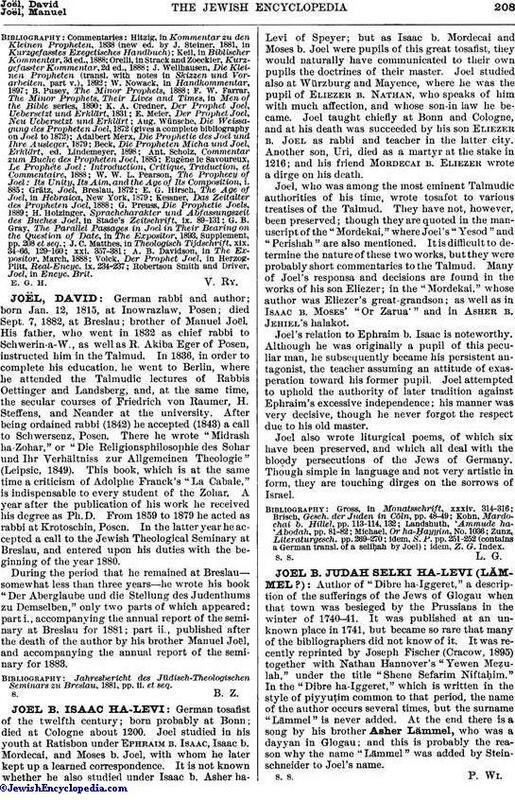 Joel, who was among the most eminent Talmudic authorities of his time, wrote tosafot to various treatises of the Talmud. They have not, however, been preserved; though they are quoted in the manuscript of the "Mordekai," where Joel's "Yesod" and "Perishah" are also mentioned. It is difficult to determine the nature of these two works, but they were probably short commentaries to the Talmud. Many of Joel's responsa and decisions are found in the works of his son Eliezer; in the "Mordekai," whose author was Eliezer's great-grandson; as well as in Isaac b. Moses' "Or Zarua'" and in Asher b. Jehiel's halakot. Joel's relation to Ephraim b. Isaac is noteworthy. Although he was originally a pupil of this peculiar man, he subsequently became his persistent antagonist, the teacher assuming an attitude of exasperation toward his former pupil. Joel attempted to uphold the authority of later tradition against Ephraim's excessive independence; his manner was very decisive, though he never forgot the respect due to his old master. Joel also wrote liturgical poems, of which six have been preserved, and which all deal with the bloody persecutions of the Jews of Germany. Though simple in language and not very artistic in form, they are touching dirges on the sorrows of Israel.